LOCRIAN is a prophetic voice of decline. From the band’s inception, it has comfortably straddled both the experimental and metal underground, weaving themes of apocalypse, urban decay, environmental destruction and birth/death/rebirth throughout its multifaceted and genre­defying releases. The Chicago/Baltimore trio originally formed in 2005 as a duo of André Foisy (guitar) and Terence Hannum (keyboards/vocals), but in 2009, the group expanded to a trio with the introduction of renowned experimental musician Steven Hess (drums/electronics). Hess’s participation in the band began with the band’s critically acclaimed album The Crystal World (Utech Records), a breakthrough release that established LOCRIAN as an adept purveyor of metallic, noisy and ambient textures alike. In 2011, the group signed with Relapse Records, which brought LOCRIAN’s work to a much wider audience beginning with the re­release of numerous catalog pieces. So far, the band has released more than 30 EPs, splits, and full­lengths in just 10 years, and has a reputation for navigating more musical territory per release than most bands cover in a lifetime. 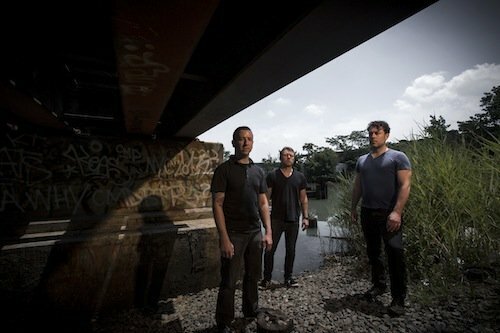 In summer 2012, the group recorded its Relapse debut Return to Annihilation, a dismally atmospheric record that Pitchfork called the “most provocative and engaging Locrian album to date.” LOCRIAN has also found the time to establish itself as an unparalleled live force. 2014 marked the band’s first European appearance, including a much­lauded set at the renowned Roadburn Festival in Holland. The trio continues to be exceptionally prolific, consistently releasing well­received albums, collaborative records and EPs that have seen praise from Pitchfork, the Chicago Tribune, Decibel Magazine, NPR, Spin Magazine, and numerous other publications. The band’s 2015 release Infinite Dissolution, based on the phenomenon of the sixth mass global extinction and humanity’s place therein, has been applauded as LOCRIAN’s most experimental and innovative work to date. Infinite Dissolution is a characteristically nihilistic record that nevertheless incorporates hope and optimism in ways the band had previously yet to explore, and has already been praised by outlets such as Pitchfork, Consequence of Sound, Exclaim! and The Quietus. Whether or not humanity survives the near future, LOCRIAN has proven that its music possesses the ideas, strength and distinction to envision entirely new worlds hundreds of times over. viagra en farmacia en Hospitalet de Llobregat. precio la viagra en La Coruna. viagra comprar espana en Granada. comprar viagra en espana en Vitoria. viagra online espana en Elche. cialis sin receta espana en Madrid. comprar cialis en espana en Barcelona. cialis en farmacias en Valencia. viagra sin receta en Sevilla. precio cialis espana en Zaragoza. levitra en farmacias en Malaga. levitra comprar online en Murcia. levitra generico en farmacia en Palma de Mallorca. levitra sin receta en Las Palmas de Gran Canaria. levitra online en Bilbao. buy online priligy in Colorado. buy priligy online in Connecticut. priligy no prescription in Delaware. buy priligy cheap in Vermont. priligy cheap online in Georgia.